The 10 books that influenced my design thinking journey. I have been on a long journey discovering the intersection of design thinking and social change. 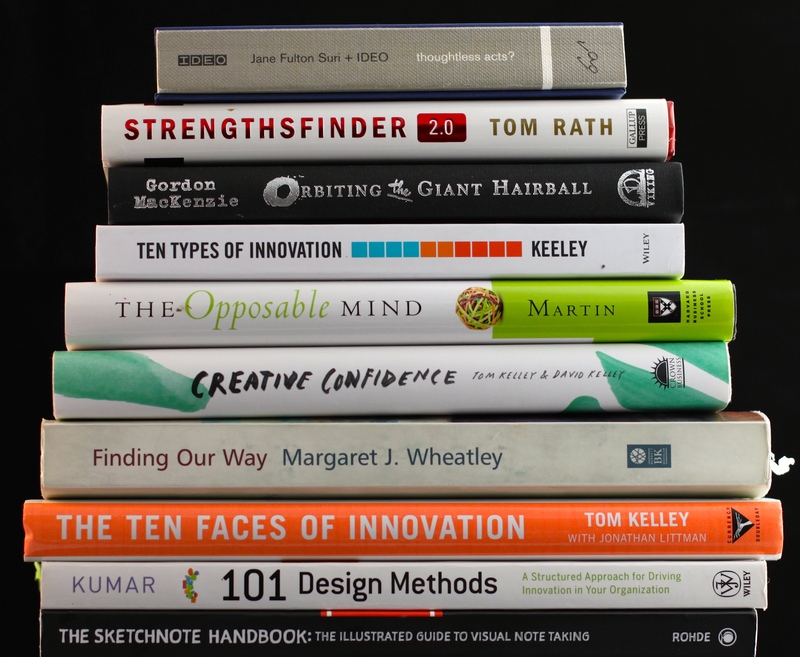 I often get asked, “what book should I read if I want to understand design thinking?” While there have been many books I have found helpful over the years, these are 10 books that have influenced me on my design thinking journey. All design starts with empathy and one of the best paths to empathy is observation. Suri’s elegant nudge encourages and inspires every reader to draw upon his/her observation muscle in everyday life. Helping individuals learn design is accelerated the more a person understands him or herself. Strengthfinder 2.0 is a brilliant tool to discover the strengths within oneself. As one colleague told me recently, “Until I took Strengthfinders, I never thought of empathy as a strength. All my life, I thought the deep empathy I have within me as a weakness.” Getting the right mix of strength on a design team helps the work soar. Strengthfinders combined with Ten Faces of Innovation by Tom Kelley are cornerstones of helping teams optimize performance. A dear friend slid this across the table early on in my design thinking journey and I often think it is an example of the right gift at the right moment. For every imaginative person out there (that is you! ), MacKenzie, 30 year creative director for Hallmark, delivers a quirky and delightful book that reminds the reader — ‘you are a creative being’. For the budding design thinker or veteran, Orbiting the Giant Hairball helps you navigate and reframe a world that doesn’t necessarily understand or value the creative and intuitive side of humanity. I keep returning to this book, and each time I learn something new. Keeley/Walters create a framework to help every design thinker look at creating a pathway to innovation through a much broader and sustainable lens. The authors bust the myth that innovation only rests in the products itself when, in fact, the innovation resided in the WAY the product came to be. This is one of the first books I read on my design journey. It had a profound impact on me. Martin shows us the power of holding two opposable ideas and, in that tension, discovering the more powerful solution. The intersection of the analytical with the intuitive is where design finds its strength. Martin gives a reader insight into the need for both the analytical and the intuitive, not just one or the other. The Kelley brothers get after one of the biggest obstacles facing individuals and organizations: unleashing creativity that is resident in each of us. This is the book I most often point someone to if they want to begin to wade into design thinking. I have come to realize what the Kelley brothers have dedicated their entire lives to: the answer often lies within us. We just need to have the confidence to release the creative capacity within. This is my most dogeared, underlined, worn out book. I often think Wheatley is 50 years ahead of her time. Increasingly, nature has become my greatest teacher. And it was Wheatley who awakened in me the elegance and instruction that exists in living systems. When I am feeling stuck, confused or just a bit out of sync in a design process, I turn to the many writings of Meg Wheatley for inspiration, insight and provocation. Tom has a way of taking the complex and making it easy to consume. One of the big barriers in the design journey is people think it is only for the “creatives”. Tom brings forward a framework where everyone can find themselves in the family picture of design. He calls out the ‘devil’s advocate’ and asks everyone to tap into their strengths and higher self. A great book to hand someone who is a bit skeptical of the design journey. Vijay Kumar has taken 30 years of development of methods at the Institute of Design at IIT in Chicago and put it into a brilliant framework. Vijay’s book is the perfect tool for someone who needs the concrete methods to understand there is a discipline and practice that sits behind design thinking. I return to this book for inspiration on new ways to tackle tough problems. When communicating an idea, it is often better to sketch it than write it. I took a class at Stanford d School on sketch note taking. This book was the workhorse guide. The simple nudge to use your sketching ability reminds us all that we have a creative muscle. And it is fun to do and often more effective in communicating your message. These are books that had an impact on me. What books impacted you on your design journey? Prev What or who inspires you? Next VIDEO: Could you live on a $5/day food budget? Thanks for all the helpful information. I’m sure this will help many of us gain new perspective on Design Thinking.